In this, the final issue of My Little Pony: Friends Forever series, we have a sibling rivalry between Princesses Celestia and Luna. Having finally aligned their schedules, the sister’s dream of participating in the ‘Sisterhooves Social’ has become a reality. However, their Royal Schedule Keeper, Kibitz, strongly reminds the Royal Highnesses of the many promises they made surrounding their royal duties this week. The stress quickly builds up as a joint effort ensues to tick off every duty on their lists, with sleep being at a premium. Their natural competitiveness comes to the fore as does the tension between them. Will the sisters even make it to the Social, or will the Kingdom be split in two? I can think of no better characters to focus on in this final issue. Much has happened over the thousands of years these sisters have been ruling Equestria, including the 1,000 years Luna was imprisoned upon the moon as Nightmare Moon. This separation caused much hurt to both of the sisters, and since being reunited, they have been trying to reconnect with each other. Both have a shared dream of competing with one another in the Ponyville ‘Sisterhooves Social’ over on Apple Acres. However, the stress in getting all their royal duties accomplished has pushed both sisters to become very unlike themselves. Stress does tend to bring out the worst in people, and tends to leave a negative mark on those around them; this is very much one of the key themes in this issue, and a plot involving their pets brings this to the fore. Kibitz is the Royal Aid to the Sun and Moon Princesses, and no stranger to the franchise. Although he has a number of appearances in the comic series, I am sure he has yet to appear on the show. Kibitz can be a stern character, known for keeping a tight schedule and ensuring the Princesses attend to all their Royal duties. His heart is in the right place, he cares deeply for the sisters, and only wishes to keep the peace between them. Upon Luna’s return from the moon, it was the first time Kibitz had met the Princess, and they are still getting familiar with one another. Kibitz is also seeing the kind of rivalry the two sisters have between them, even though they were a thousand years apart. With Luna now living in the Castle again, Kibitz is seeing a whole new side to the normally graceful Celestia. The action really does kick off when the sisters make their appearance at the ‘Sisterhooves Social’ on Sweet Apple Acres. Their actions and tempers are questioned during the festivities, all of which is soon forgotten when the countryside comes under attack by gigantic beasts. Unfortunately the only member of the Elements of Harmony still left in Ponyville is Rarity, who alongside her little sister Sweetie Belle, teams up with the Royal Princesses to save Equestria from destruction. This issue can be bought with three varying cover arts. 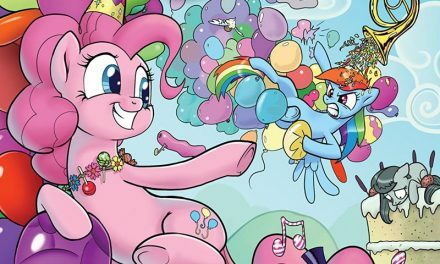 The regular cover is featured at the top of this review, and is by Tony Fleecs. This is a stunning piece of artwork, and stays very true to the character designs used in the show. This is my ideal version of the two sisters, and both seem to be showing a bit of annoyance of one another. The argumentative attitude has even influenced their pets. The subscription cover, pictured in the centre of this review, is by the story’s writer and artist, Andy Price. Emotions have escalated quickly between the two siblings, as anger and frustration collide. The Royal Highnesses are horn to horn in this heated clash. Their pets stand astonished in between their owners. It certainly sets the tone rather well for the story. Finally we have the retailer incentive cover by Sara Richard, pictured above. This is another familiar art style, as the coloring pencil/pastel motif returns. The sisters face one another, each holding their own castle. This issue is a strong story to end this exciting series of Friends Forever. We get to see the competitive spirit alive amongst the sisters, seeing another side to them that we very rarely get to experience. Although their past has been beyond difficult, it is nice to see that although they are royalty, all sisters have their moments where they clash. This is certainly a memorable issue and one that is available to buy now from IDW Publishing.